It’s essential for any real estate agent to be able to craft top quality real estate brochure content. Even though we live in a digital age and most of our marketing is done online, it’s no excuse for being sloppy with your brochure content. Both your online and printed marketing material strongly benefit from two things: top quality content and professional design. At the end of the day, you need to be representing yourself and your agency with brochure content that really resonates with the target customer in a way that looks pleasing. We all want to maximize the effectiveness of our brochures and flyers. It makes our marketing dollar spread further and when you really hit the nail on the head you get better results. So how can you do that more often? What are the building blocks for a really great real estate brochure? For starters, get your message right. Before you even begin designing something you need to decide what you want to achieve. Are you showcasing a recently sold listing to other house owners in your area in the hope of attracting more listing leads? Are you working on your list of buyers and tempting them with a new property that you have available? Or, are you just letting your area know how your services and track record can work for them? Whatever your message is, keep it focused and don’t be afraid of not talking to everyone. You need to ensure you’re talking to specific people with a specific purpose. Next, ensure you are being clear about your message. Clarity is super important. Don’t underestimate the potential for confusion. If you’re showcasing a sold property to get more listings, make it clear that the property is sold, it was you that sold it and you’re available to sell more. Lastly, make your call to action short and sweet. Too much information or unclear wording can make your call to action confusing and distract readers from what you want them to do. A great tip when it comes to designing your brochure content is to style the layout and design to suit your demographic. If you’re selling in a young and hip area – keep your imagery fresh and current, focussing on the lifestyle interest of locals. If your neighbourhood is up-market – work the luxury angle and show them what it will be like living amongst their peers. What you need to do is help people see themselves in the picture. The more you do this in your marketing, the more the customer will make the call to connect. If you want to differentiate yourself as a unique agent your real estate brochure content needs to come from a different angle. This will help set you apart from your competition. This could be as simple as your color choices, changing the size of your marketing piece or improving the quality of the stock used to print on. For example, rather than using gloss like everyone else, try using a slightly heavier weight uncoated stock. With the right design, an uncoated stock card can look stylish and high-end. Think about how your brochure piece can be more tactile and interesting to touch than your competitor’s marketing material. Try to excite your customer’s senses and your brochure will really stand out. The old saying of a photo can speak 1000 words is absolutely true. I suggest using images that speak the words you want your customer to connect with. As with my point about understanding your market, make sure the target audience can see themselves in any imagery you use in your brochure. Also, try not to overdo it – one high-quality large hero image is much more effective than 20 random snapshots. Always use professionally shot images, if you aren’t a photographer yourself, don’t even entertain doing them yourself. 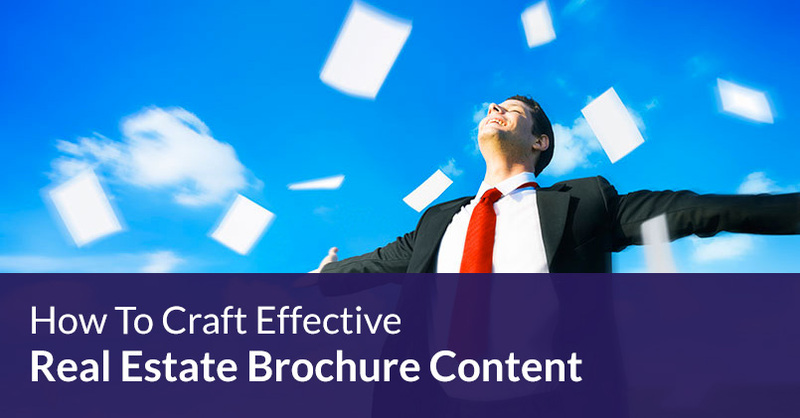 You only have one chance to connect your real estate brochure content with your customers before it gets tossed into the bin. If the main image is a do-it-yourself snapshot, you’ve wasted your time, effort and money. Keep it professional and the extra cost will pay for itself. Remember to keep your branding and styling consistent throughout all your real estate marketing material. Brand consistency throughout your marketing establishes a familiar identifying pattern that your customers can associate with. This enables better recall and places your business as a recognizable player in your local market. We’ve all seen those photocopied/Xeroxed flyers that just make you cringe. Don’t let your marketing material end up in the bin or lining the bottom of the birdcage! Jigglar can provide you with access to hundreds of industry proven templates that you can easily make your own within minutes. You’ll not only save a massive amount of cash on design costs, but you’ll always have access to fresh new templates designed for maximum results. Jigglar is a real estate dedicated marketing tool which means we’re working to help you get you more listings and sales.